Poles have always loved to eat, and traditional Polish cuisine is as rich in flavors as Poland’s history is rich in traditions. 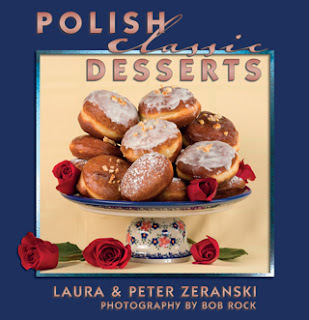 The classic recipes in this book were carefully selected to provide a cross section of traditional Polish dishes that go way beyond kielbasa, pierogi, and cabbage rolls. This is the special food many of us grew up with. This is the special food many of us remember. This is the special food we long to taste again. Are you lucky enough to have experienced traditional Polish dishes someone in your family made when you were young? Do you still recall those fabulous tastes and aromas as a treasured part of your childhood? Do you ever wish you could reconnect with those memories and taste those fabulous foods again? If your answer is YES, then here, just for you, is a beautifully photographed collection of special recipes to help you relive those mouth-watering dishes, just as you remember them. Has anyone close to you been yearning to taste those classic dishes again? Here is an opportunity to create new memories and pass them down to the next generation, just as you would pass down family stories or photos. The traditions and classic feasts of years ago were very meaningful. Bring them back today and make the next holiday celebrations just as special. Have you ever visited Poland and enjoyed the country, her rich traditions, and delicious food? Do you just want to try some intriguing, new flavors? You don’t have to be Polish to love Polish food. If any of these possibilities rings true, then this book is for you! These heritage dishes have been handed down from generation to generation. Each recipe has been tested and perfected in the authors’ home kitchen. They have been updated for modern kitchen appliances and techniques, while taking great care to preserve each recipe’s classic roots. The preparation steps are very clear and easy to follow, plus the authors provide many helpful tips accumulated over 40 years of cooking traditional Polish foods, as well as many fascinating and sometimes humorous personal peeks into a lifetime of enjoying this classic cuisine. These foods will be loved by your family and friends. They will love you for sharing them and you will love creating new memories and family traditions that will live for the generations to come.